Mount Victoria is a mountain on the isle of Palawan, far away on the other side of the world. High up on its summit, in a few scattered populations, there exists a wondrous plant. Nepenthes attenboroughii, the plant so rare it doesn't even have a popular name, is thought to consist of only a few hundred individuals. Don't let anyone ever tell you that there are no more wonders to be found in this world, because Nepenthes attenboroughii sat undiscovered on the peak of that distant mountain until as recently as 2007. The most amazing thing about this plant, however, is how it gets its nutrients. It grows in poor, rocky soil, and so must supplement its diet with other living things. That's right. 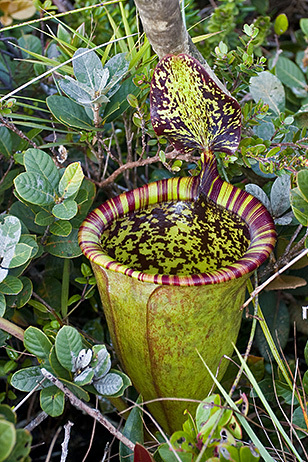 Nepenthes are carnivorous plants, known as pitcher plants for the modified leaves they use to trap unsuspecting prey. These "pitchers" emit the sweet smell of nectar. When an insect comes to drink, though, the slippery rim of the pitcher causes it to fall into what is essentially an open stomach full of digestive enzymes. Nepenthes attenboroughii produce pitchers that are over a foot tall, nearly 7 inches in diameter, and can hold up to two liters of rainwater and enzymes. That means this plant could easily handle a rat that might fall into one of its pitchers. This is truly a wondrous creature, both for its rarity and its dietary habits. I have included a video below that shows this plant's close relative, Nepenthes rajah, growing pitchers through time lapse video. It is beautiful to watch. Interestingly, the man narrating the video is Sir David Attenborough, for whom the recently discovered species was named. That might be the most amazing living thing on the planet! I want one! Actually, they are quite easy to find online. The higher altitude nepenthes varieties can tolerate cooler temperatures and lower humidities, making them a suitable windowsill plant.